David Rainger has been in the music game a long time – long enough to move from session player to pedal builder, and to establish his name in both fields. Nominated for Pedal Of The Year for his Reverb X unit, John Tron Davidson sought him out to talk LEDS, circuits, and pushing electric guitar to the next level. BTM: David, thanks for talking to Break The Machine. 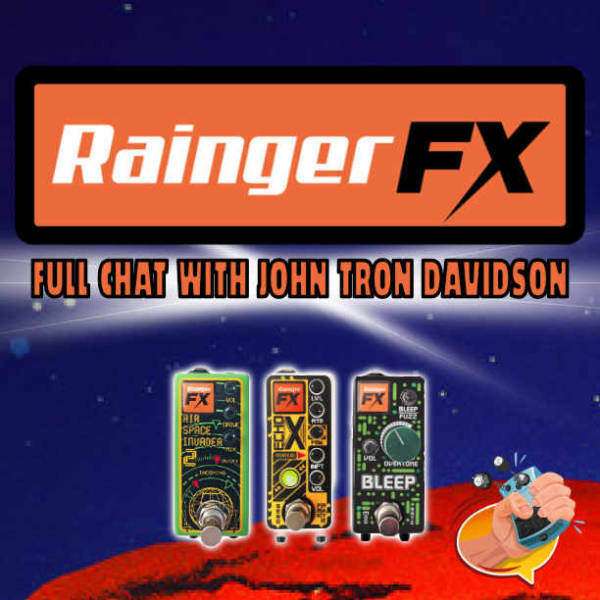 For our readers who don’t know, can you tell me how Rainger FX got started? DR: I’m a guitar player and been in lots of bands like everyone has, and I guess around the mid 90’s I started doing more and more sessions. I always had a lot of pedals, and I also worked as a journalist for guitar mags reviewing pedals – if there was anything interesting or unique, I’d buy it and take it along to my sessions. I was there to provide hooks for recordings – a new sound or a riff, and from that I started ordering pedal mods from other people, then commissioning builds from scratch. In the early 2000s I thought ‘Could do this myself?’ – I got a book from the library and started working on an Elektra fuzz. I managed to put it together and it actually worked! I couldn’t believe it…. amazing!!!!’. I thought, ‘so what else can I make? !’ I downloaded other diagrams, changed things around using my own ideas and what I’d picked up along the way, taking bits from older pedals and seeing what else I can do. In 2009 I took the ones I’d made to Denmark Street (in London) and the shop manager said ‘we’ll take another 10 of those’! And that was the start of the company! BTM: Rainger has a style all its own – what made you choose such an old-sci-fi looking setup? DR: I guess I love LEDS, and whatever I can do to get more LEDs on the pedals I’m right there! I hate doing metalwork. I’d started buying enclosures and doing it with a hand-held Dremel drill, there was lots of filing too and I hated it, so I thought I’ll bite the bullet and get them made. And if I’ve got this company making it then why not have fun with it? Perancea in west London – where we’re based – they’re a big help and up for it. With a pedal like the Air Traffic Controller, I figured why does symmetry matter? I liked the idea of a rocky landing, why not? I thought we’d make it look like the windows round the cockpit of an airliner too, so we went totally asymmetrical. When it comes to the actual graphics I usually did it myself and I love doing it, but it takes quite a while. One day I got contacted by a guy who bought the first mini pedal I’d made, and he said ‘if you need any graphics done, let me know’. I kept the email, and not long after was doing this new pedal with lots of switches so I thought I’d get in touch with him – Rick DiMaio his name is – he said ‘send it over!’ (he’s in Staten Island, New York). So I sent it and two days later he sent his work back to me and it knocked me out! We’re pretty much in tune with how things look and it’s good to work with someone else who’s not in the same room – because he has a completely detached, unbiased perspective. We’ve never met, never skyped, just email, and that’s all part of it! BTM: Where does the desire to push the sound of guitar way out come from? I guess I’m pretty old and I come from the punk/new wave era, where the feeling was if it’s not new and original it’s just rubbish! I think it’s really important to push forward. I understand people cloning things, but the people those builders are copying are originators themselves, people who were deliberately taking the wrong step, trying to break something, just to get to something new. I think that’s related to what I’ve been doing – when I was doing sessions I had to come up with hooks, anything that made it stand out – anything that grabs people’s ears. And that’s still what I’m trying to do – though these days it’s very often not me that’s doing the playing. BTM: I have to ask, where did the design for the Freakenstein come from? DR: It started from the circuit which I found online – a really extreme fuzz. I tweaked it here and there, and changed bits and pieces to get it to sound the best. At that time Maplin did a plastic 1:6 scale ‘control console’ enclosure – like from a Barbie science laboratory – which really fitted with the sound, and I looked around for other parts, found this great knifeswitch – and it had to have a meter too, to complete the vibe! So the original run had a manual throw switch to make it work! The PCBs were all hand etched with an etching pen by me, I had to get the chemicals out and etch away, everything hand drawn and drilled by hand, and I thought if someone is interested in buying this then it’s worth all of the time I’m putting in – all the hand wiring and everything… If think if I looked inside one today I’d just close it back up and quietly walk away! But then I was just thrilled that someone might actually want to buy it. And I still am, really. I loved this pedal and thought this thing sounded wicked – with the Overtone dial where you find a sweet spot that’s cool, but I thought I’d also work on a modulation circuit to sweep the Overtone automatically. And I also thought it would be great if you could do it in real time by foot, so we came up with the idea of a pressure pad. My expression pedal was a wah-style thing, a huge controller in a massive enclosure but so heavy, I didn’t want to carry it around. The original version of Igor (the pressure pad controller – Dr Freakenstein’s assistant) was based on a hinge with a bicycle inner tube and it worked! I made a lot of them, going down to cycle shops and asking ‘got any inner tubes?’ ‘Only one with holes in.’ ‘Great!’… I liked the fact I was recycling materials as well. A lot of R&D went into Igor to make it more durable and more consistent, and then recently we started selling them on their own. All expression pedals vary in terms of how they’re wired up, and their resistance, they all differ from brand to brand, so Igor works with some pedal brands but not with others. On the website we put up the other companies it’s compatible with, including companies like Electro Harmonix and Death By Audio. I worked out that Igor is 35 times lighter than a normal expression pedal and looks way cooler! It’s included with of most of the pedals we do. Once you get used to it you can do all sorts of things and it has no moving parts and doesn’t take up loads of space. Over time we’ve tried all kinds of ideas with varying degrees of success; some things are really appalling and some work great! BTM: Looking back on what you’ve built so far, what’s been the most rewarding build? DR: Of course it’s the most recent, the Bleep, which is the latest version of the Freakenstein. It’s a compilation of a bunch of different sounds from the four Dr Freakenstein Dwarfs (which are all now discontinued), all the best bits together! It’s interesting how the LED display affects your playing, somehow gives you more confidence – it’s not for the audience, its for the player. The other one I couldn’t get over was the Reverb X. I liked the idea of doing a reverb but putting an overdrive after the reverb, which exaggerates the sound in a really exciting way. It was so great, but there’s a problem when you stop playing because the background noise is very loud – you have to have a noise gate. OK, I can do that – but putting the gate after the reverb was amazing! When you stop playing the whole sound is cut short and it makes it sound like it’s an edited sample, like you’ve nicked it off some classic record! And adding the distortion builds on that. BTM: The pedal world seems to have embraced micro’s as the way to go, but you’ve been making smaller enclosures for some time. Was this a question of real estate or personal preference? DR: It is something that I like to do. Everything that I make, it’s got to be cool and cute looking. When I make a new pedal I carry it around in my bag for weeks and weeks, I’ll take it from room to room with me! These new mini pedals (like Mooer etc) are great but the sockets are on the side – I’ve never understood that. So I worked out a way of making the enclosure half a millimetre narrower, with the jacks on the top end panel, and they have 2 or 3 circuitboards inside, stacked up this little wedge of metal that produces this amazing new sound. There’s nothing wrong with having a pedal you want to carry around with you and pick up and hold, and it sounds, looks, and behaves just great. You look at some pedalboards and it’s all big blank metal enclosures…. Of course the bottom line is the sound – but there’s nothing wrong with having it looking irresistible too! BTM: Do you do custom builds? If so, what’s the most out-there thing you’ve been asked to build? What do you get asked for the most? DR: I haven’t had that many requests… People have asked, but I’ve not really done anything – the most usual thing it’ll be is something like to change the value of the parts to suit someone. Making pedals is often so hard to do, and however straightforward you think the next one’s going to be, there’s always a point where you think ‘this isn’t doing to work’. I’d love to say I’d do it but…. No, sorry! Don’t get me wrong – I’m extremely interested to hear people’s ideas for new pedals, but if I’m not into it it’s not going to happen – I’d give up working on it after the first morning! After all, I’m the one that’s got to sell it, and if I’m not into it, it’s just not going to fly. I think it’s important for me to be that committed to an idea. If I am interested though, I’ll make every effort possible to bring it to life. BTM: There’s some hefty names on the Rainger books – can you tell us a bit about how you got hooked up with Bonamassa/Gibbons etc? DR: All of them are complete luck! I think a couple of times I’ve approached a management company and tried to get some big name to try a pedal, but never really got through to anyone. One day I got a call from a guy in a shop in Denmark St saying that Joe Bonamassa had come in and bought one, one of the original Dr Freakensteins! With Billy Gibbons, it was some bloke that ordered one online, and he emailed after a while to say that he’d lost the Igor, and can I send him a replacement? So I sent him one and a spare. I never heard a word back until six months later, when he emailed to say thanks a lot – by the way I’m Billy Gibbons’ guitar tech, have you got anything you want to send Billy’s way?! Billy liked the current Freakenstein and El Distorto, which was great. With John Frusciante, a DJ friend of mine said to me ‘do you know this guy Frusciante? He’s a techno DJ and I’ve just done a gig with him, and I told him about you and the pedals’. They had four hours to kill backstage so he shows John the website, then a few days later I get an email from his tech and he bought a couple! I’m no good at blagging and that kind of networking, I don’t know how people do it. BTM: Do you still get involved in the studio environment? DR: Only very occasionally, and that’s not from me turning things down if I’m honest! The last 10 or 15 years the bottom’s fallen out of the recording industry – there’s no budget and they can’t afford me! Usually the producer will play a bit of guitar, stick it through a few plug-ins…. BTM: Have you got anything in the pipeline that you can share with us? DR: There’s a big thing coming up for next january that we’re working on, and now that the Freakenstein MkIII is discontinued, I’m working on the MkIV. Plus something very exciting for next spring, a new version of a standard effect that should be great. It’ll come through when the time is right…. DR: I’m quite into electronic music, but of course I played in rock bands for decades. I’m working in the workshop with other people and we inflict our musical tastes on each other. I end up listening to fair amounts of stoner rock and metal, but recently Khruang Bin (a Thai funk band), Vulfpeck, Meshuggah – I was surprised by that – and stuff like the Chemical Brothers is always good, Prince-y stuff, Jam & Lewis… Suicide – they’re awesome! Basically if it’s got an old cheap drum machine in it I’m pretty much down with it! DR: I love it – most of the time. It’s really rewarding in every way, except in the financial way, but you’re making beautiful little things bringing them into the world and that’s amazing. If you’re reading this and thinking of doing it then just try it! Have a go, there’s nothing like it, it’s great. Also, I’ve become aware that all the builders, whether they’re big or small, they’re all helpful, really friendly, all good people; there’s a real pedal community. This doesn’t exist in a lot of fields of endeavour – people can be a bit secretive, or have an arch nemesis, but when we meet people at the NAMM tradeshow doing the same thing they’re all friendly and want to help out. Working in electronics is different in that if you were writing a book and you give it to a friend to read, maybe they say it doesn’t work. So you hone it down, improving it here and there, and gradually it gets there. With pedals, you complete it and it probably doesn’t work no matter how hard you try, and days and days go by and nope – just doesn’t work. And then one day you try something and suddenly….. it works!!! And you’re like ‘It’s Working! It’s Working!’ It’s a physical buzz – you’re king of the world, high as a kite and looking for the next thing to make! BTM: David, thanks for talking to us, it’s been a right old chat. DR: I’ve really enjoyed it, genuinely, it’s been a pleasure! Check out this article on Boutique Pedals.